See scan - very good condition. This is a nice and rare Bulgarian opera singer Nikolai Ghiaurov table medal. Obverse shows the portrait of the singer and reverse has his autograph signature in English and Bulgarian. 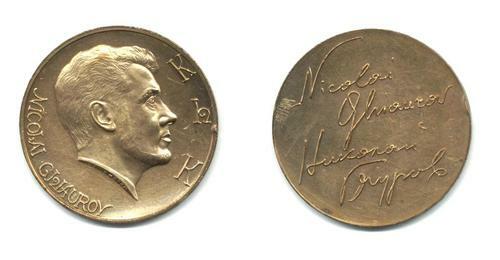 Medal was made in Germany by Peter Heinz and is engraved under the portrait. Nikolai Giaurov is one of the most famous opera singers and sings for the La Scala in Italy. Nice opera collector piece and one of the nice Bulgarian medals.